My passport says I’m not Irish. My family has never lived here. I wasn’t born here, never went to a school in Ireland. My mum never read me Irish fairy tales. I only heard phrases like “Grand!” and “Thanks a mill!” when I visited Ireland for the first time. My first night in Dublin consisted from a visit to a now closed Zanzibar on north quays and a walk along the river Liffey. Despite it being February, I remember my surprise over a good weather. 4 month later I moved to Dublin to start a new life. Sure, it didn’t feel like home at the time, but Dublin was like a caring nanny for me. Soothing the feeling that all my friends and family are 3 hours flight or a significant phone bill away. 6 years later I can’t imagine my life without Ireland anymore. This country has a very special place in my heart. Every time landing in Dublin airport my heart starts beating faster. It’s good to be home – these are the words going through my head. However for others home is not necessary a physical location. It can be their own special imaginary place where only certain activities can take them to. For a professional dancer it’s a magical world of dance. Heartbeaat of Home is a true celebration of dance on a stage. Dancers from different cultures are bringing you a piece of their heart, to be able to assmeble a multicultural beast with a dance for a beating heart. Irish dance and music influence runs throughout the production, creating a whole new direction. Styles are fused together to create something bigger than individuality. It’s so relevant, given the level of diversity and the amount of people from different countries living in Ireland. We sure bear our own traditions and cultural tweaks, but it’s impossible not to be influenced by irish culture while living in Ireland. 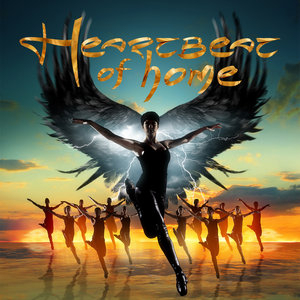 Heartbeat of Home is a spectacular show which proves that different cultures can easily co-exist and blend together creating something spectacular. Live band, moving platforms on stage, dazzling costumes, incredible vocals and visual effects together with highly skilled dancers from around the world create that magical feeling of something miraculous. While watching the show I felt so proud and privileged to be able to be part of this culture. Moving to be reminded that my heart belongs to this country. I tend to think that I grew up here in a way. It has been a long and at times a rocky road. My relationship with Ireland hasn’t always been perfect either. Sometimes it felt that we are better apart, but I could never say goodbye, because I love it too much. I learned how to love the rain and complain that it’s too hot, when the temperature rises above usual. I find cities charming and cozy and countryside calm and beautiful. I love the feeling of free spirit. It doesn’t surprise me anymore that you can see people wearing T-shirts and winter jackets on the same day. Home is where you feel good, so despite me not being exactly irish, I consider this country to be my home. I love you, Ireland!